IT’S POSSIBLE TO ARGUE THERE’S NO SUCH THING as Woodlawn. Geographically, the neighborhood is bounded by Jackson Park, King Drive, 60th Street, and 67th Street, but its true demarcations—its identity and unifying characteristics—are murkier. Woodlawn lacks the natural cohesion of other city neighborhoods: there are no softball leagues (or fields), no arts district, few storefronts, and fewer community centers. Residents don’t necessarily feel connected to each other or to the jostling neighborhood groups that claim to represent them. The vacant lots dotting the landscape both embody and contribute to Woodlawn’s social fragmentation; the physical gaps between neighbors widen their isolation. Community gardening on empty property has become one of the area’s few civic activities. Until this decade, when development began picking up and new residents began moving in, Woodlawn’s history was a marathon of decline. Between 1960 and 2000, its population fell from 81,279 to 27,086 as integration provoked furious white flight (in 1930 Woodlawn was 86 percent white; by 1960, 10.4 percent; in 2000, 3 percent) and worsening poverty chased away middle-class blacks. In the 1960s and ’70s neighborhood deterioration sparked “insurance fires” that claimed more than 100 buildings. Gangs commanded the streets. Taverns overtook 63rd Street’s once-bustling commercial corridor, until finally most business died. Across the Midway’s grassy moat, meanwhile, the University raised its drawbridge. After early-1960s protests foiled their urbanrenewal hopes, some U of C officials ignored the neighborhood. Others sought engagement. In 1968 high-school basketball coach Larry Hawkins became inaugural director of the University’s Office of Special Programs—a post he still holds—organizing Upward Bound curricula for youngsters in Woodlawn and elsewhere. By the 1970s Chicago’s education dean began looking for ways to help local public-school principals. A few students tutored Woodlawn grade-schoolers, while individual professors offered after-school and summertime lessons in math and science. Today many of those efforts have become institutional. Students and faculty volunteer through the Center for Urban School Improvement and the Neighborhood Schools Program as tutors, mentors, and instructional coaches. They work with Woodlawn social-service agencies, the University Community Service Center, or activist groups like the Student/Tenant Organizing Project (STOP). The Office of Community Affairs seeks to preserve and create affordable housing, while the Civic Knowledge Project, an organization founded by Humanities dean Danielle Allen, aims for an unusual exchange: University book-learning for neighborhood memory and experience. Civic Knowledge Project staffers arrange programs, tutoring, and library access for local residents, who help catalog and archive their neighborhoods’ cultural, economic, and political histories. Even if Woodlawn residents haven’t decided to trust the University, they’re certainly seeing a lot more of it. In the past 40 years, says TWO chair Leon Finney, his relationship with the U of C has evolved from conflict to collaboration. Proof, she says, lies in the $20 million plan to renovate the Midway. During neighborhood skull sessions in 1999, locals were eager to open a connection to the University and soften the Midway’s uninviting immensity. “The community wanted a bridge,” Malunda says. “They wanted activities on the Midway to reach across to Woodlawn.” An ice rink opened in February 2001, and the plan also envisions a children’s garden and a playground. Last September city and University officials unveiled a one-acre memorial garden just west of the Midway honoring longtime Chicago professor and Woodlawn resident Allison Davis, PhD’42. As University Police outreach officer, Sergeant JoCathy Roberts appears at condo-board meetings, schools, libraries, and police-beat meetings. THE BAD OLD DAYS ARE GONE. That much Leon Finney Jr., chair and CEO of The Woodlawn Organization (TWO) and founding pastor at Metropolitan Apostolic Community Church, can say for sure. Unbuttoning his suit jacket and leaning into the polished expanse of a leather armchair, Finney recalls Woodlawn’s dark age in the 1960s: slumlords, white flight, failing businesses, and surging street crime. 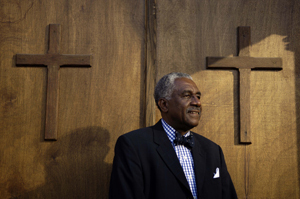 Cofounded by Bishop Arthur Brazier, whose Apostolic Church of God on 63rd Street claims an active membership of more than 18,000, TWO began as a militant protest organization. Power and the passing years have mellowed its rhetoric and widened its calling. Today the group functions as a social-service agency, child-care provider, real-estate developer, property manager, and housing advocate. Since the early 1970s the organization has worked with University administrators (who emphasize their “junior partner” status) on projects such as Jackson Park Terrace, a low-income high-rise at 60th Street and Stony Island Avenue constructed and later renovated by the Community Development Corporation (TWO’s real-estate arm) with financial help and a long-term lease from the University. In 1987 collaboration helped spawn the Woodlawn Preservation and Investment Corporation (WPIC), whose board includes higher-ups from both groups: Finney, Brazier, Webber, and Nimocks. A few years ago, a WPIC project to enliven eight empty blocks of 63rd Street with 233 homes (one-fifth affordable housing) began. Last May WPIC, TWO, and the University—with input from local residents and funding from the MacArthur Foundation—published a “quality-of-life” plan calling for, among other things, a business district along Cottage Grove Avenue, a playground in west Woodlawn, an expanded employment center, and a neighborhood arts council. WHEN HE WAS A KID, WALLACE GOODE JR. and his friends played ball in the middle of the block. It kept them safe, he says, from lurking gang members. Somebody suspicious would round one corner and Goode and his buddies would bolt toward the other. “We’d be running through gangways, people’s basements, people’s garages, everywhere.” Goode’s home—and nearly his whole universe— was on Minerva Avenue and 66th Street, one of the few neutral blocks in 1960s Woodlawn. Steps away stood “100 percent gang territory,” he says. “Your world was very small in those days. Because of the gangs, you mostly stayed on your block.” Yet Woodlawn maintained thriving businesses for years—Goode got his first job at a shoe store on 63rd Street—and a lively nightlife. “It was a vibrant African American community where you could find doctors, lawyers, businessmen, and people on welfare all living on the same block.” After he left for Elmhurst College in 1970, an exodus of black middle-class residents decimated and impoverished the neighborhood.